As you can see by the picture above, we have very diverse precision custom stamping capabilities ranging from very small complex parts to larger parts of every description. The knowledge gained from the production of these parts over the years is combined with our efficient production stamping facility to produce the exact parts required, within your budget and time constraints. Some examples of our stampings include automotive door components, clips for brake cables, vacuum cleaner washers, electric mirror, furniture, hospital furniture components, clips to hold furniture partition panels, assembly line components. Thank You for considering Forward Metal Craft for your precision metal stamping project. 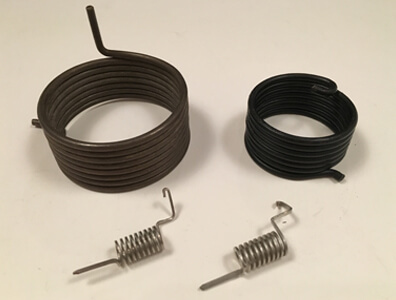 To ensure flat springs, wire forms, brackets, clips, clamps flat wire, flat terminals, and intricate springs are of the highest quality possible, it is imperative to work with a professional. In addition, the appropriate material must be used. For example, there are different companies that supply and work with materials for multi slide stamping but some stand out from the competition to include Forward Metal Craft. In simple terms, multi slide stamping is a unique process that forms metal for producing high volume of small stamped components. For this, flat stock sheet metal formed from different metals to include those listed above, is shaped in a stamping press to achieve the desired part configuration. As part of the process, a slide helps maintain movement that goes into and comes out of a motionless table known as a press bed. On the upper part of the die is a component that connects to the slide while the lower component connects to the press bed. As the sheet metal is forced through the die, the “punch”, which is another die component, shapes the material. For transfer or progressive operations, multi slide stamping is the preferred choice. This type of stamping is unique to other processes since moving slides have tools attached. These tools strike the workpiece to create the appropriate shape. The four shafts that outline the machine drive it but also connect to bevel gears. The result is that one shaft is driven by an electronic motor while the other three are driven by the shaft’s motion. For each of these shafts, cams drive the slides. With this unique arrangement, the workpiece can be worked for four sides. Near the center of the machine is a hole that expels the finished workpiece. Simply put, multi stage stamping is an integration of forming and shaping operations.